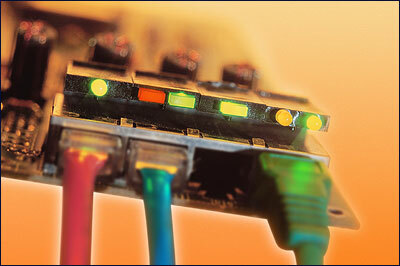 94V-0-compliant packaging is designed to nest with RJ45 ports on the pc board. Single or dual LEDs are available with rectangular or domed lenses, with diffused lenses standard, and clear lenses as an option. This article appeared in the Oct 2001 issue of Electronic Products. For additional information on how to incorporate LEDtronics LEDs into your product designs, contact LEDtronics toll free at 1-800-579-4875, telephone 310-534-1505, fax at 310-534-1424, click here to email us or mail at LEDtronics Inc., 23105 Kashiwa Court, Torrance, CA 90505. Visit our website at www.LEDtronics.com.